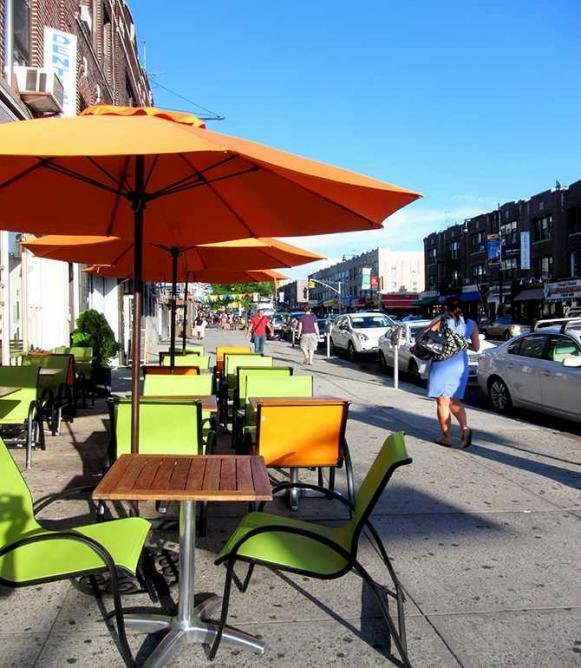 Astoria, Queens has long been a great place for brunch, and the recent influx of young professionals to the New York neighborhood has only helped this trend along. Whether you’re looking for casual or elegant, healthy or bottomless, we think you’ll find what you want in this list of our 10 best picks. Be prepared for long lines outside the door of Queens Comfort, a kitschy spot that serves up American comfort food with a modern twist. Mixed Berry, Cream Cheese-Stuffed French Toast, Fried Green Tomato Benedict and Cornflake-Crusted Chicken Sandwich are just a few of the eclectic offerings, and the visuals on the website will give you an idea of the decor, a mash-up of down-home and retro styles. 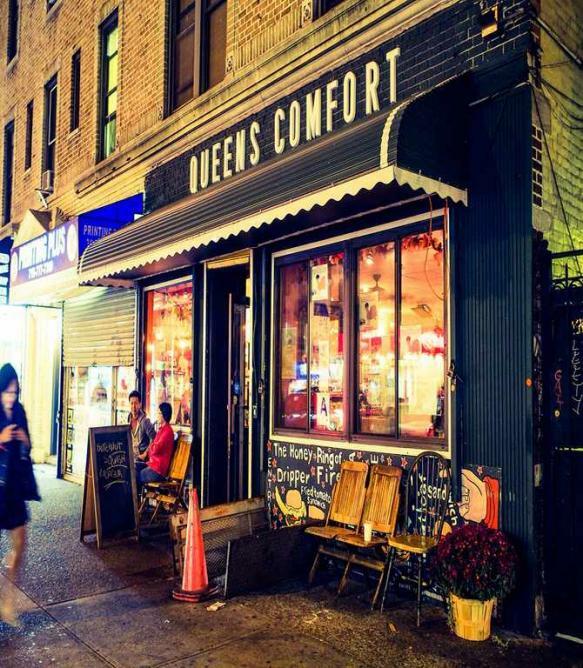 Queens Comfort is cash-only and BYOB. DiWine offers a relaxing brunch in a classy setting. 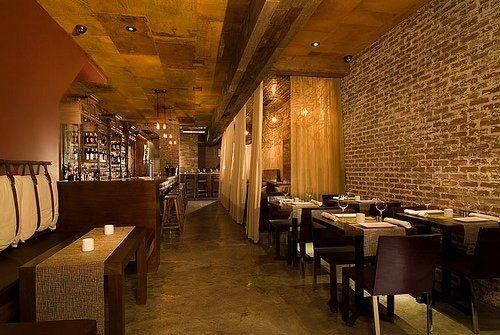 Dim lighting, candles and earth tones set off an interior that is a blend of industrial and upscale. Highlights are Banana Bread French Toast and a selection of fritattas and pizzas. For an extra charge, you can add unlimited Bloody Marys, mimosas and bellinis. Located on the corner of 31st Avenue and 33rd Street, Brick Cafe is the ideal spot for either a quiet, intimate brunch or a gathering with friends. From the bread basket with olive tapenade to the pasta dishes and the decor, Brick Cafe exudes a modern European vibe. Egg in a Hole, Croque Monsieur and a generous selection of ingredients for ‘create your own’ omelettes are menu staples. Outside dining is also an option here. If you’re looking for a healthy start to your day, Ovelia is a solid choice. This Greek restaurant has a three-page brunch menu with many options that would make a gluten-free vegetarian happy. You can even substitute ‘fruit fries’ for the traditional home fries. 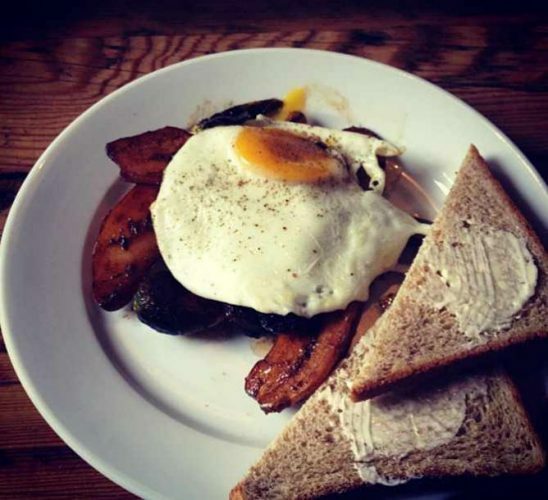 Egg dishes, waffles and flapjacks come with a mimosa, Bloody Mary, coffee or orange juice. The owners of Sugarfreak have a connection to New Orleans, Louisiana, and their goal is to bring authentic Creole and Cajun food to Astoria. Unique appetizers such as brunch oysters and popcorn alligator share a menu with Jambalaya and eggs, Funnel Cake French Toast, grits, po’boys, waffles and fried chicken. A selection of brunch cocktails keeps the Creole theme going. In addition to brunch on Saturdays and Sundays, Sugarfreak has a Midnight Brunch from Friday into Saturday, 12 a.m. to 3 p.m.
Vesta Trattoria & Wine Bar features a brunch menu ‘inspired by Italy and guided by the greenmarket.’ Eggs are paired with polenta, buttermilk pancakes come with cara cara marmalade and a ‘hangover pizza’ comes topped with potato, pancetta, sausage, fried eggs and spicy tomato sauce. Refreshing wine cocktails sweeten the experience. Although The Queens Kickshaw is best known for its fancy grilled cheese sandwiches and craft beers, don’t count it out as a brunch option. Choices include french toast with satsuma, mandarin oranges and Chinese five spice-infused maple syrup, a layered potato cake, Rancher’s Eggs with jalapeno cornbread and more (including grilled cheese and mac ‘n’ cheese options, of course). Mexican restaurant and tequila bar Mojave is a good place for margaritas and bottomless brunch on Saturdays and Sundays. You can have your entree served with unlimited margaritas cocktails plus coffee or tea. A lower-cost prix fixe option includes one cocktail and coffee or tea. Choices from the classic huevos rancheros to sofrito chicken and hash brown quesadillas definitely make for a flavorful start to the day. Front Toward Enemy puts their own spin on bottomless brunch by offering unlimited punch at ‘Punch Brunch.’ Enjoy Irish-inspired breakfast fare and several varieties of burgers along with this treat. Dillingers is a classic, laid-back neighborhood pub. Start your weekend morning here if you want to catch a game and enjoy a more affordable bottomless brunch for. It also offers a quieter, less crowded atmosphere than some of Astoria’s other hot brunch spots.